This project is not a new one, far from it. 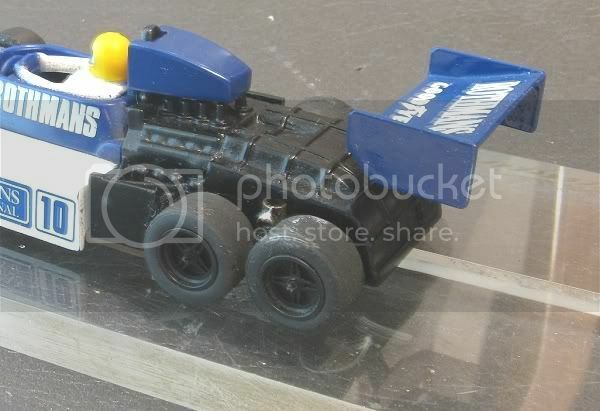 It must be four or five years ago now when myself and a friend dabbled with creating a functional four wheel drive rear end for a working slotcar. This was just one solution. 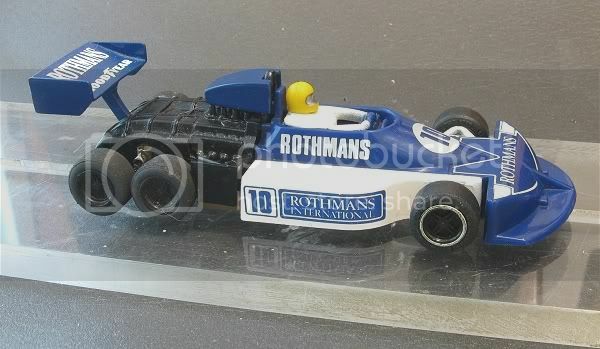 The other is also in this section (See Williams FW08b). 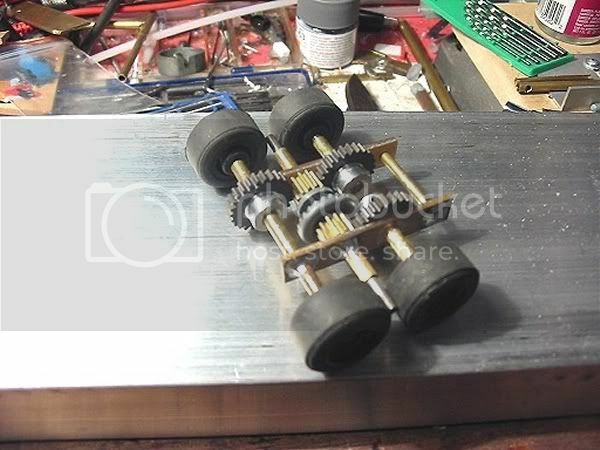 Friend and fellow slotcar enthusiast Terry Cosgrove and I bounced a few ideas off each other and Terry, being an engineer from way back, came up with some working drawings and I set about making them work. Using th `KISS’ principle, I went for a brass and pcb construction that could be assembled dry and soldered in situ. One pre requisite was that it had minimal moving parts as every extra part would generate friction and with each moving part would come a speed loss. Unlike the Williams which drove the front gear and took power off to the rear gear, the idea was to introduce the motive force directly into the heart of the final drive, with axles picking up power from a central capstan. Another problem was going to be matching the gears to the optimum ratio requirements. After all, it was no good having a compact final drive if it had a final drive ration of 10 :1!! The stumbling point here was gears readily available on the open market. 64 pitch would have done nicely but we were unable to find the pitch in spur gears!! Pinions weren’t a problem. After some searching the internet and a lot of lost leads ending in blind alleys I referred back to `Patto’s place’ who had the closest gears to what I was looking for. So, gears procured, I set about final assembly. The rear end consists of pcb side plates with brass tube laterals that took the axles and also acted as a hub for the crown and pinion gears. The drive goes straight to the centre crown gear which rotates on a primary shaft with two pinions. These in turn rotate the secondary axle shafts. The front shaft had to be split in two to allow the pinion to pass through to the primary shaft, hence the two spur gears on the front axle. The rear was simple enough as it was to be a solid axle. Another pre requisite was to have the sub frame pivoting. This was to allow good track contact on all four wheels. This was achieved by building what could be possibly a fore runner to the now popular `wixle’ axle mount set up on which the frame hung by the primary shaft. But, this was later to prove a problem and some alterations had to be made. No matter. With the subframe assembled it was time to fix it into the model and on to the rear of the pcb chassis. Finally, to lend an air of credibility it was necessary to `box’ in the whole assembly. 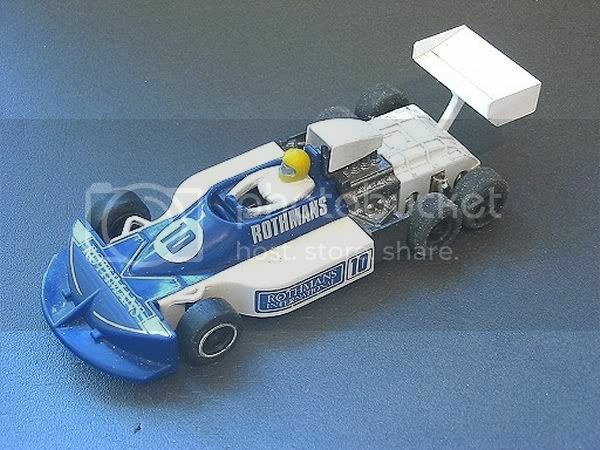 After all, it wouldn’t look too convincing to have a bunch of whirling gears exposed at the rear end. The solution was simple enough but greatly removed from the layout of the original 1/1. To the eyes of the informed the rear end is pure fantasy, but for the sake of modelling, I attempted to build a fantasy gearbox. This was done with plastic card. External ribs were added and the whole was painted in satin black enamel. Once again, far removed from the real thing, but a solution nonetheless. 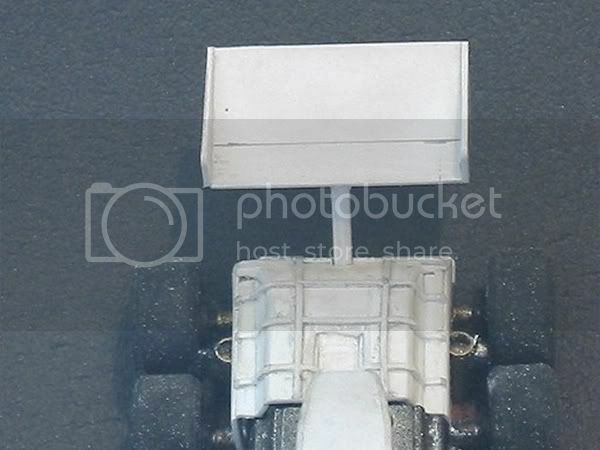 The model was a scrapyard donor originally, so I manufactured an intake airbox and a new rear spoiler. Painted and decaled them to match. Finally, the model was fully assembled and ready to test. The first blindingly obvious problem was the movement in the sub frame due to torque reaction. During acceleration and braking the model perched up on the `front' rear axle. This wasn’t to be an easy one as there was no way I was going to devise a damper system to eradicate this. I settled for a much simpler and easier solution. At the sacrifice of the tilting subframe which was intended to create equal track contact for all rear tyres, I settled on fitting a small side bracket with a slot through which a grub screw passed and screwed into the side of the subframe. Loosing the tilting subframe was a bit of a blow but now with all wheels fixed, all I had to do was set the model on the test block and tighten the screw to hold the frame in place. A light sanding ensured all wheels had as close as possible equal contact to the track. Back on the track the model was far more convincing. The last problem to be addressed was the lack of terminal speed due to unobtainable ideal gear ratios, and, friction losses through the drive train. 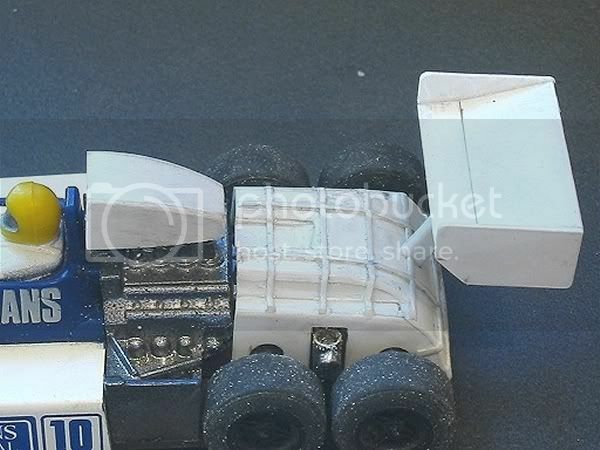 The friction loss was minimised by application of good old Tamiya `fine’ plastic polish. This got the whole system running quietly and reduced the wheel locking braking effect. 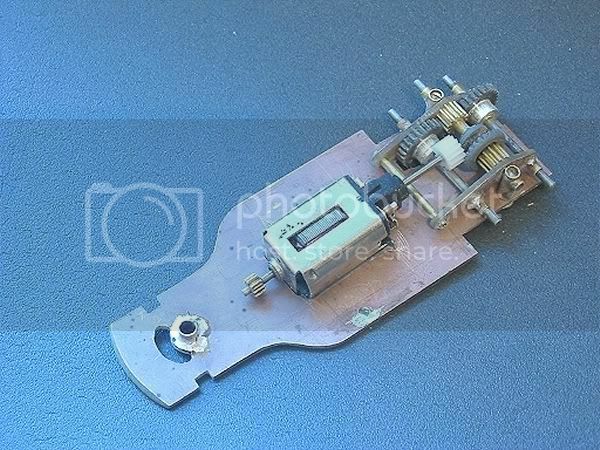 Lastly and unavoidably, the lack of speed was addressed by removing the motor, rewinding it with the next gauge wire up and shimming the magnets to increase flux around the armature. The model may not be the fastest in the world but it does now have a respectable turn of speed, and the cornering? Well, it speaks for itself. On board and plastic it behaves impeccably through the most demanding of corners and with a fresh set of `MJK’s, it literally corners as if it WAS on rails! !